J. Arthur Bower's Hydroleca is a lightweight clay aggregate formed by special clay minerals expanded at a high temperature. This produces ceramic "pebbles" with a smooth outer crust and a honeycomb interior. These pebbles are sterile, non-toxic, inert, resistant to algae, extremely strong and can absorb up to 40% of their own weight in water. They are not damaged by frost and have good insulating properties. Use one part of Hydroleca to three parts of compost to make a lighter weight growing media. J. Arthur Bower's Hydroleca makes an ideal lightweight drainage layer. Spread a 5cm (2") layer of Hydroleca onto the bench in the greenhouse and keep moist to improve the humidity. The moisture will be gradually released to the plant pots sitting on it. Use a layer of Hydroleca instead of pot shards or pebbles in the bottom of pots and other container before filling with compost to ensure excellent aeration and drainage. Houseplants benefit greatly if the pots are placed on a moistened layer of Hydroleca in a deep dish or pot cover. J. Arthur Bower's Hydroleca is also an attractive pot topping and watering aid. A layer of Hydroleca in drainage channels under lawns will improve their performance as the "pebbles" resist compaction better than other traditional materials. 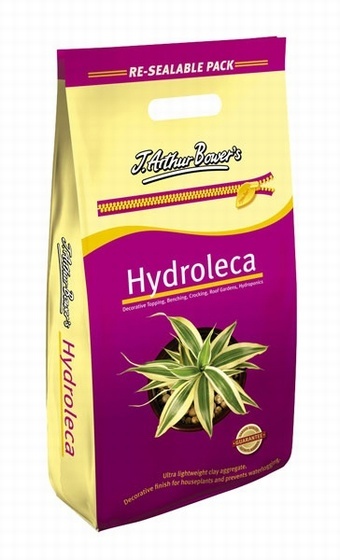 J. Arthur Bower's Hydroleca is suitable for use as a hydroponic growing medium. Apart from the Hydroleca, plants only need water and nutrients.